I know. 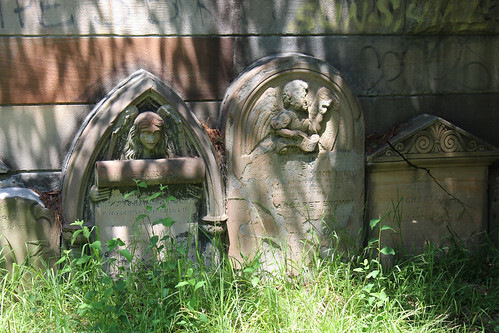 It's so predictable, doing a cemetery tour on the Halloween weekend. You could even say that sort of thing has been done to death. But in all honesty, it ended up being more of a happy accident. During dinner on Friday night, the conversation turned to ghosts (because Halloween was around the corner!) 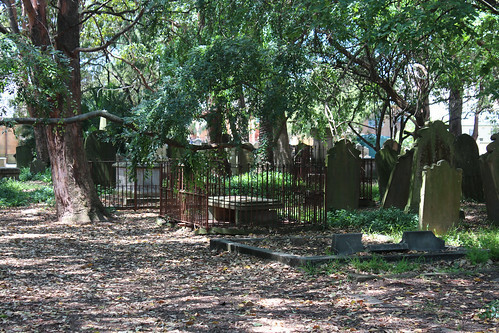 to Camperdown Cemetery, to the history and incredible stories of the people and monuments that are located there. 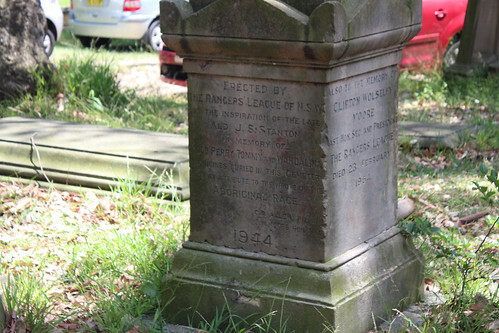 Then during the course of the evening it was discovered that St Stephens actually runs cemetery tours on the first Sunday of the month and conveniently, the first of November was also the Sunday coming. A couple of emails, and Sunday plans were made. 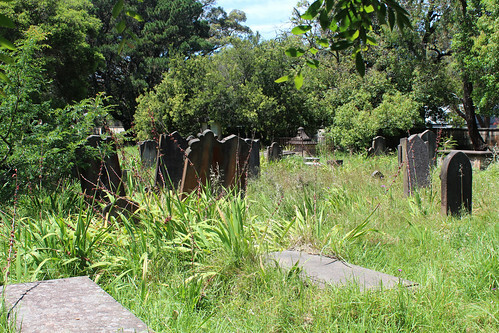 It wasn't my first visit to Camperdown Cemetery - the parish actually encourages people to use it during the hours that it's open. 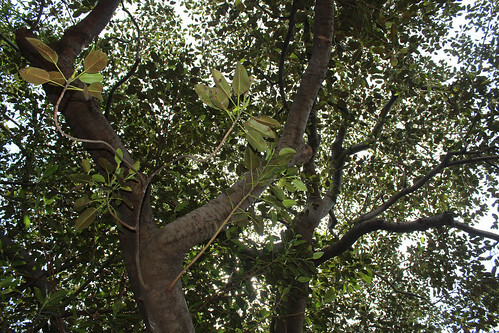 You'll often find people picnicking, reading, creating or resting and meditating around grounds. 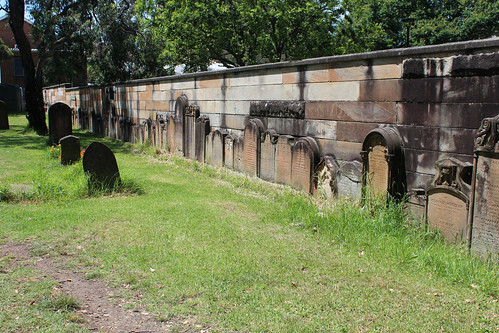 Even if you don't visit within the walls, if you visit Camperdown Memorial Rest Park (which surrounds the church grounds), you're still using the cemetery in a way. 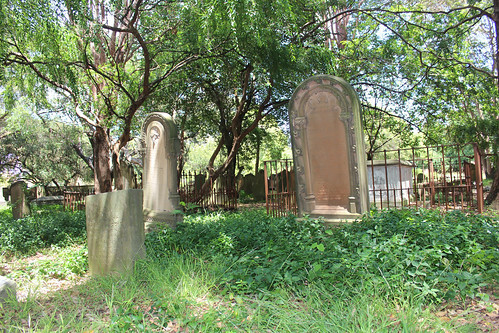 It originally spanned the whole area of the park, but after some tragic events in the cemetery the majority of it was reclaimed for parklands in 1948 and the headstones outside the new boundary were moved to within the freshly-built walls. 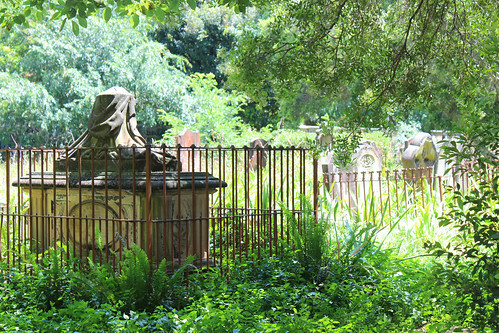 The cemetery itself is beautiful - lush and green, shaded by many trees and exceedingly peaceful. 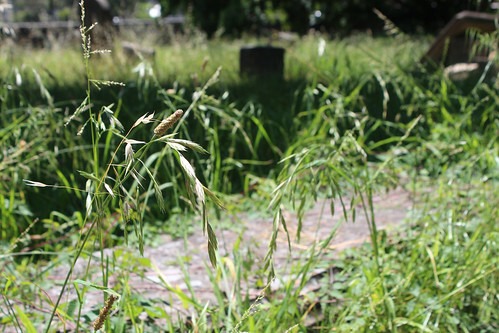 It's overgrown in places, partly due to the funds needed to keep it maintained, and partly due to the fact that a section of the cemetery has heritage kangaroo grass that isn't allowed to be mown. It's thought that the patch of kangaroo grass here is one of the few (or maybe even only) patches that dates back to the origins of the NSW colony. 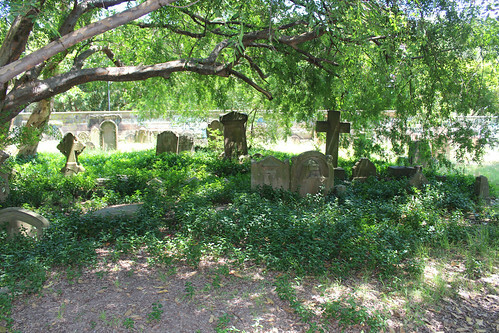 Given that this cemetery was the third to be established in the colony of NSW, there are quite a few significant monuments to be seen. A couple of particular interest to me were those of some early Sydney women, for very different reasons. 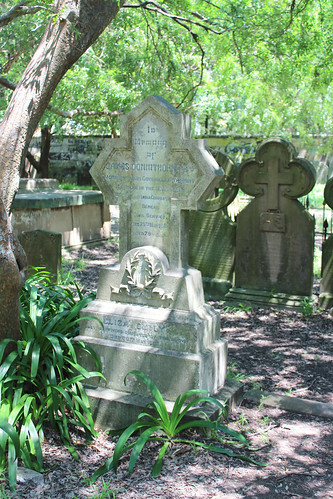 Firstly we met Bathsheba Ghost, a convict who after gaining her freedom worked her way up to Matron of the Sydney Infirmary and became one of the most highly-paid women in NSW at the time. 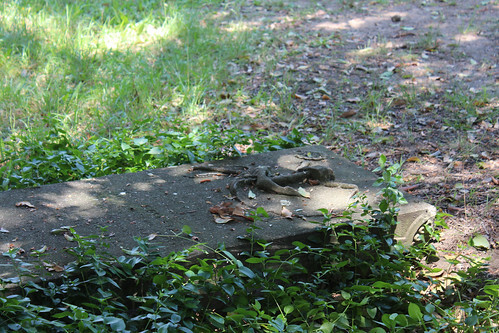 The story goes that she can still be seen around the rectory, tending to anyone who is sick. 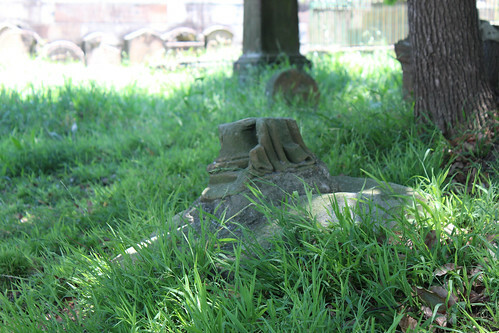 Later in the tour there was Eliza Emily Donnithorne, who is said to be the inspiration behind the character of Miss Havisham in Dickens' Great Expectations. After her husband-to-be didn't turn up for their wedding, she became a recluse and never left her house, seeking solace in books and only allowing her lawyer, clergyman and doctor to visit. It isn't known what happened to her beloved, though it is thought that her father either paid him off to leave or had him killed. 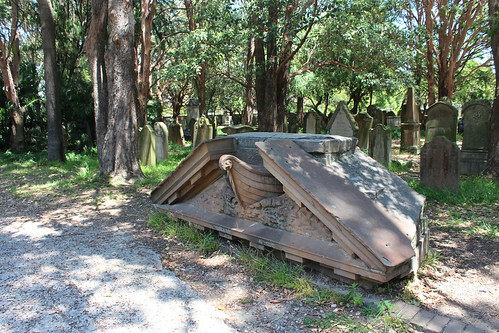 Camperdown Cemetery is also the final resting place of those who were aboard the Dunbar when it broke apart and sank after hitting South Head in bad weather. 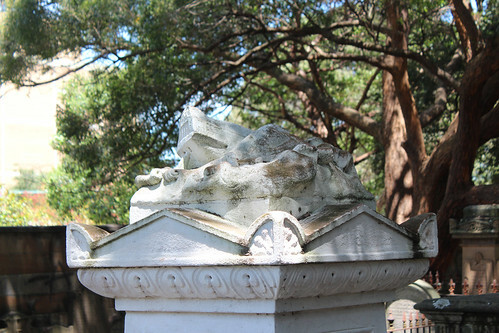 There's a few monuments associated with the wreck - I didn't manage to get good pictures of the main one. 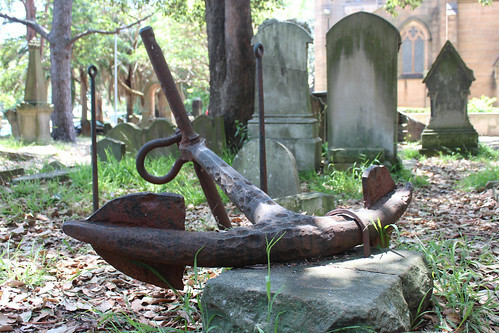 The Dunbar isn't the only maritime-related monument in the cemetery. There are anchors and even ship's propellors to be found. There's also parts of old maritime buildings hiding along the paths. 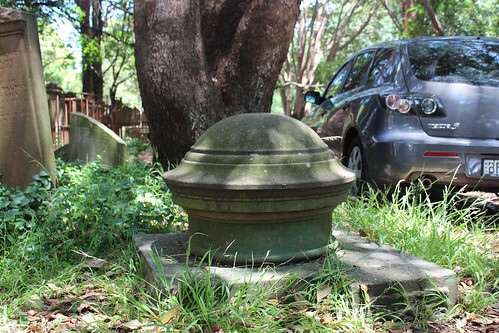 The most famous resident of all would be Thomas Mitchell, surveyor-general and explorer. He's not the Mitchell of Mitchell Library, but he is the Mitchell of the Mitchell Highway, Mount Mitchell, and Major Mitchell's Cockatoo, amongst other things. The tomb was in shadow at the time I was there and I didn't manage to get decent pictures. I see myself coming back here. There's so much to explore and see as the tour only covers the most significant monuments. Who knows... I may even end up running into one of the resident ghosts! Wow, what a lovely place! 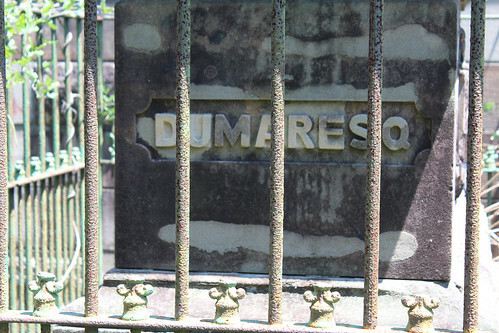 The tombstones embedded (?) in the walls are a bit surreal.